“The Monuments Men” was a recent book and movie that told of the heroic efforts by American and European soldiers and civilians to recover cultural treasures stolen during World War II. Art and architecture suffer greatly during wars, either as collateral damage or through direct attack. But a much more insidious form of damage occurs to a more essential aspect of civilized life: the environment. And so, the United Nations, starting in 2001, has designated November 6 as International Day for Preventing the Exploitation of the Environment in War and Armed Conflict. The day recognizes the need to protect the natural environment before, during and after military actions. The environment suffers inherently during armed conflict. Wartime action by its very nature destroys landscapes, whether cities, farms, forests, streams or coastlines. 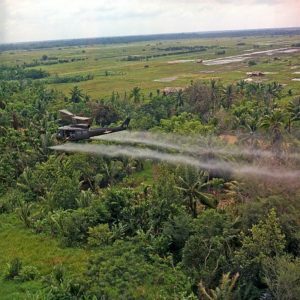 During the Vietnam War, for example, vast areas of forest were defoliated using environmental poisons, including dioxin in the form of Agent Orange. During World War 2, Allied forces developed techniques to destroy dams and did so to a series of dams in Germany. Armies and refugees also heavily exploit natural resources for food and for products to pay for supplies. During decades of strife in the Democratic Republic of the Congo, elephants were poached in large numbers, for the meat but also for the tusks, which could be traded on the black market in exchange for weapons and ammunition. Hippopotamus populations were heavily overharvested for food, and forests were cut for fuel. In the early 2000s, UNESCO put all five World Heritage sites in Rwanda on its endangered list. Military action also sabotages the environment as a way to thwart the opposing side. During the first Iraq War in 1991, retreating Iraqi forces started more than 600 oil wells on fire and opened valves on oil lines. Nine months passed before all the fires were extinguished. The losses and damages exceeded those of the Gulf of Mexico oil spill by orders of magnitude. War and the environment also share a more direct relationship. According to the UN, since the 1960s, at least 40% of all internal armed conflicts have been fights over natural resources—from diamonds to water rights. And battles over natural resources don’t tend to go away; the UN estimates such fights are twice as likely to resume than are conflicts based on other reasons. Fortunately, the legal underpinnings of environmental protection during war are beginning to be established. As early as 1977, the Geneva Conventions added protection for the environment. The Red Cross and Red Crescent have adopted environmental guidelines during wartime. An ongoing working group of the United Nations continues now to develop standards for the “Protection of the environment in relation to armed conflicts.” Aspects of their draft text include (1) designation of areas to be protected because of exceptional environmental importance or concern, unless a direct military objective; (2) prohibition against general environmental damage unless involved in direct combat; (3) no environmental damage as reprisals; and (4) special consideration for environmental losses that may be widespread, long-term or severe. Enzler, S. M. 2006. The impact of war on the environment and human health. Lenntech. Available at: https://www.lenntech.com/environmental-effects-war.htm. Accessed November 6, 2017. Jacobsson, marie G. 2016. Working to Protect the Environment in Armed Conflict. Medium, United Nations Environmental Programme. Available at: https://medium.com/@UNEP/working-to-protect-the-environment-in-armed-conflict-ce9aff1aa479. Accessed November 6, 2017. Mathiesen, karl. 2014. What’s the environmental impact of modern war? The Guardian, 6 November 2014. Available at: https://www.theguardian.com/environment/2014/nov/06/whats-the-environmental-impact-of-modern-war. Accessed November 6, 2017. United Nations. International Day for Preventing the Exploitation of the Environment in War and Armed Conflict, 6 November. Available at: http://www.un.org/en/events/environmentconflictday/index.shtml. Accessed November 6, 2017. United Nations. 2016. Protection of the environment in relation to armed conflict. General Assembly. Available at: http://legal.un.org/docs/index.asp?symbol=A/CN.4/L.870/Rev.1. Accessed November 6, 2017.